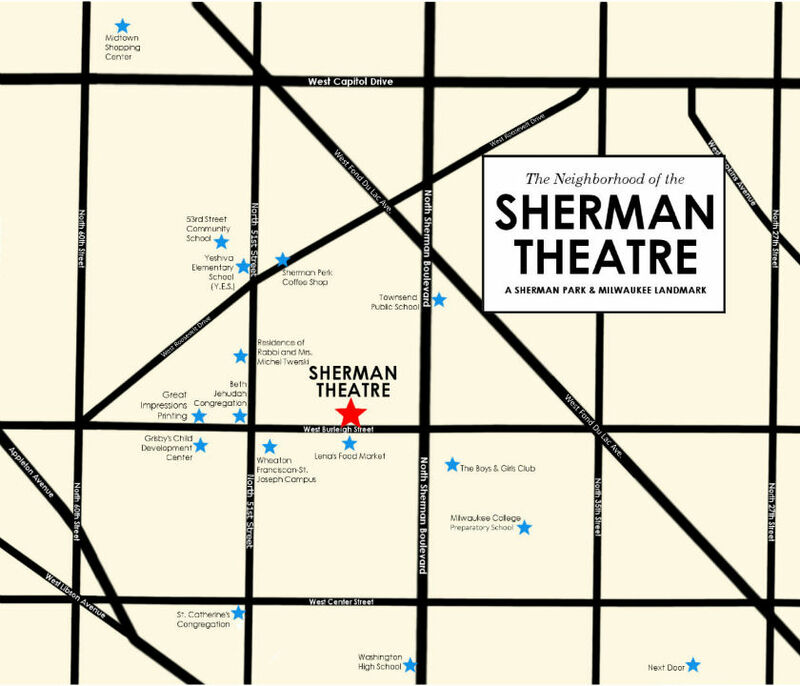 Here is a map detailing the assets of the area surrounding the Sherman Theatre. Below the map is a key describing these assets in more detail. Click on the map image to enlarge it. Sherman Park Community Association – One of the oldest community-based organizations in Milwaukee (founded in 1971). A major stakeholder and partner in the Sherman Theatre project. Congregation Beth Jehudah – A Jewish Orthodox synagogue led by spiritual leader Rabbi Michel Twerski. Mainstay of the neighborhood for decades. A vital group of individuals whose spirit and vitality offer a positive dimension to the area. St. Joseph Hospital – The neighborhood hospital serving the Sherman Park community. Its staff is committed to patients and to the area it serves. Community members of all ages rely on its high standards for service and outcomes. Washington High School – An MPS school that was the educational institution that produced many of Milwaukee’s finest leaders. It continues to set the pace for excellence in education. Staff cares deeply about working to ensure that every student reaches his/her full potential. Sherman Perk – A fun, casual meeting place for coffee and discussion. Clientele come from the diverse Sherman Park community. It also draws customers from metropolitan Milwaukee and suburban locales. Nurturing friendships and building community happen here. Great Impressions – A neighborhood location for high-quality graphics and imagining services. Recipient of the Urban Entrepreneur Partnership Inner-City Growth Award. Lena’s– A grocery store in Milwaukee’s first Kohls food store building. It provides quality products and quality service. The food market as established 45 years ago by Bezelee and Lena Martin and is now proudly operated by a second-generation of Martins. 53rd Street School – MPS school serving students in K3 through 8th grade. Its creed “I can be whatever I want to be” is recited daily by students as they are encouraged to believe and achieve it. Townsend Street School – This school, serving students in full-time K4 through 8th grade, features an after-school program and partnership with the neighborhood Boys & Girls Club. The school also partners with Wisconsin Lutheran College beginning at fifth grade. Grisby’s Day Care – A neighborhood daycare center that is operated by the Grisby Family. The development center serves a diverse and deserving population. Midtown Shopping Center – An urban shoppers’ oasis, Midtown offers a variety of convenient retailers, including Pick ‘n Save, Starbucks, Applebee’s, Wal-Mart and many more retail destinations. St. Catherine’s Church – The church and school serve the Catholic community in the neighborhood. Its mission is to educate an urban community of diverse populations. It is a hub for the activities of Common Ground. Milwaukee College Prep – An outstanding charter school that has expanded its number of schools to reach as many students as possible. It is led by a dedicated staff committed to the well being of its “scholars” (as they are called). A “can do” philosophy guides all practices. Boys & Girls Club – The Mary Ryan Boys & Girls Club is dedicated to its members in the Sherman Park community. It serves as a safe place for children and teens to spend their time after school or during the summer. Next Door – New to the neighborhood (recently purchased from the former Northwest General Hospital) and the location of a major, far reaching Head Start Program. Next Door has a reputation for being among the very best in its field. It has five-star rating by YoungStar, the state’s rating program. Yeshiva Elementary School (Y.E.S.) – A Jewish Choice parochial grade school with more than 200 students. Parents and staff have a long standing commitment to the Sherman Park neighborhood. Students receive an excellent religious and secular education. For over three generations their leadership in both the Jewish and general community has been strong and positive. Their presence has enriched the Sherman Park neighborhood and will continue to do so moving forward. People from outside the state of Wisconsin have moved to the Sherman Park neighborhood to live near Yeshiva Elementary School, Congregation Beth Jehudah and other institutions the Twerski family has cultivated. Share your memories of the Sherman Theatre with us!